Numerology charts usually consist of pages of numbers and notes on a yellow pad. There are some problems with that. It's hard to oversee the chart as a whole, to recognize the connections between a range of numbers. This is crucial during a numerology consultation; you have to be able to see the relationships between all the numbers quickly, clearly, and easily. All numbers in an individual’s numerology chart absorb and reflect energies from each other. In the early 80's I gradually grew into a habit of creating crude schematics that showed multiple numbers in a chart. Over time, the schematics became more organized, until eventually the lay-out grew into an easy-to-oversee concise numerology chart showing all relevant numbers as well as fifty years of cycles. I made generous use of symbols to differentiate what any of them meant, and adding color based on number values (1 is red, 2 is orange, etc. ), for easy viewing; color-coding not unlike a bookkeeper or librarian might do to organize their files and books. I want to make it clear that I didn’t invent the algorithms. 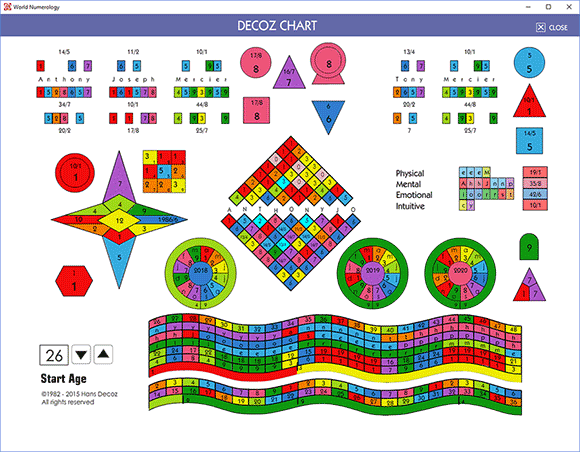 The numerology chart now known as the DecozChart uses long established Pythagorean calculation methods. All I did was create an organized lay-out for myself. There were a few things I noticed early on. Not only was the end result a chart I could work with without having to flip pages and look for notes, the focused effort of calculating and creating the chart by hand put me in a state of mind, or activated my intuitive powers, to such an extent I would have a pretty good idea of my next client’s posture and look. I am sure I would be able to pick my client out of a group, even though I had never met them. Below are sections of a numerology chart with the name and location of each number. I will use the fictitious Anthony Joseph Mercier, born October 12, 1986, and who goes by Tony Mercier. The top left of the chart is used for his full name at birth, the right side for his current name. The Heart's Desire, Personality, Expression, Maturity, and Balance number are all based on the letters and their numerology values in the full name. The Minor Heart's Desire, Minor Expression, and Minor Personality are based on the current name and play a lesser, and very different role. Whereas your full name at birth reflects who you are - think of it as your numerological DNA - the name you use to introduce yourself shows how you see yourself; who you think you are. Or see analysis of famous people, including Bill Clinton, Barack Obama, Trump & Putin, Donald Trump, Prince George, and Debbie and Carrie Fisher.